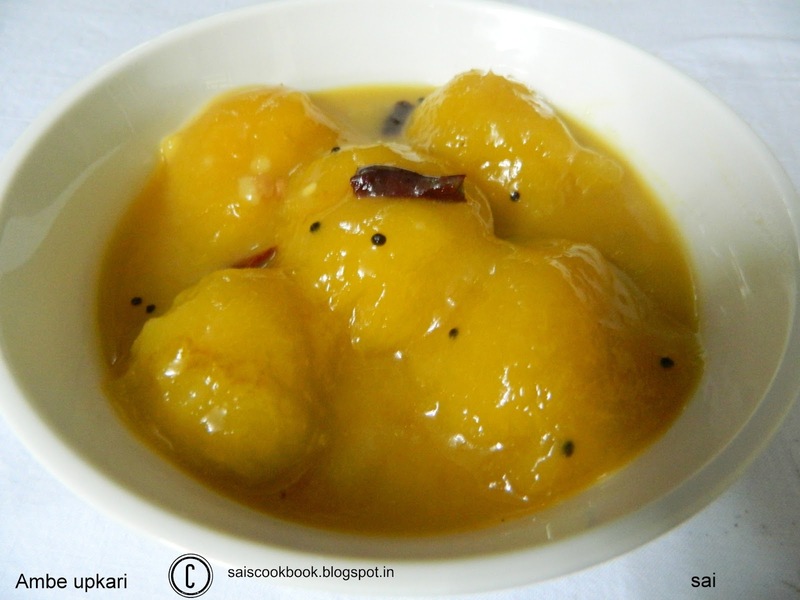 Ambe upkari or Ambya upkari is a famous dish of the G.S.B’s prepared maximum during the mango season that is during the summer season.This curry is prepared with the special mangoes which we get during the season known as Gointo Ambo which is small in size and the seed has fibres which is used to seep the juice of the curry which is the specialty of the mangoes. 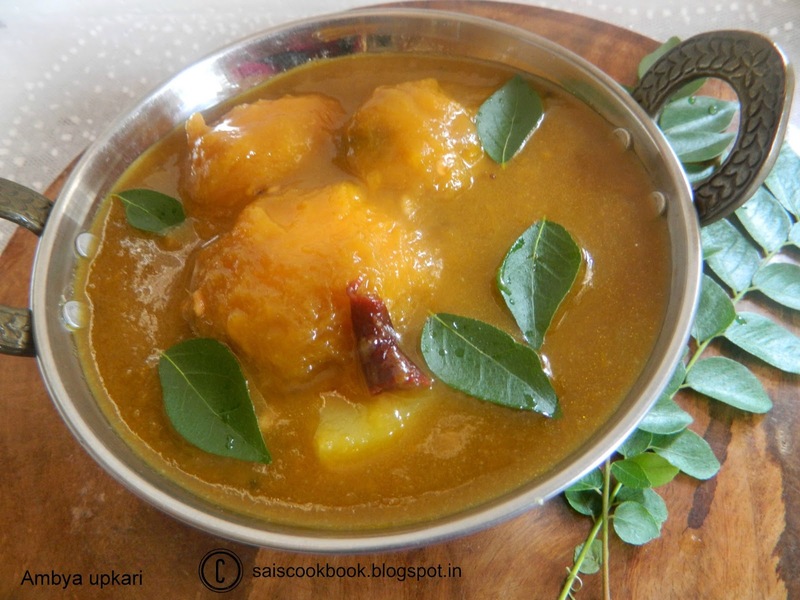 Gointo Ambo are the local Mangoes which has a sweet and sour taste.This curry may be prepared with any ripe mangoes or even with mundappa raw mangoes(Almost ripe) by cutting it into pieces.Maida mixture is added to thicken the gravy and it gives a good consistency.The gravy of the dish is semi thick,not too thin nor not too thick.The curry can be relished hot or cold.This curry is served in most of our religious functions like weddings,house warming etc. Add a cup of water to the mango skin and squeeze the juices out, as much as you can and add this juice to the mangoes. 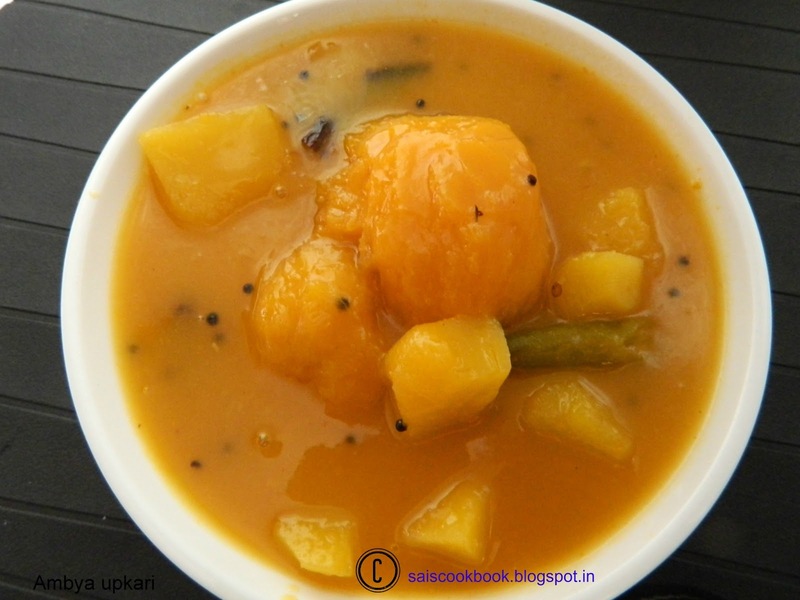 Repeat the above step once again and add the juice to the mangoes and then discard the skin. 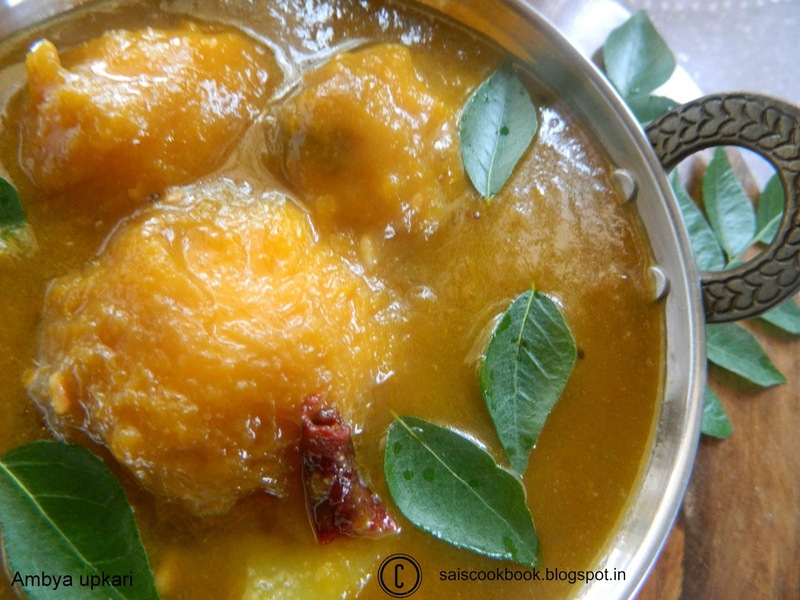 Add jaggery,green chillies,a pinch of salt to the mangoes and cook the mangoes stirring in between and take a boil. Add maida mixture and stir it well,add desired quantity of water to adjust the consistency,boil it well and off the flame. Heat oil in a small seasoning pan,splutter mustard seeds,add curry leaves,urad dal and red chillies and fry for a second. Season it to the mango upkari and close the lid immediately.